Blog Hoppin': First Day of School Activities! We started school here in Indiana last week. Our first three days went so well! I'm excited for the year ahead. Here are a couple of first day activities that helped us get off to a good start. 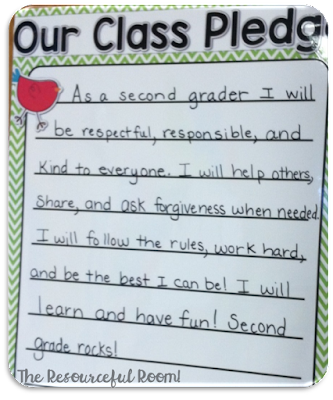 After reading a lot about classroom management this summer I knew I wanted to have students write a class pledge/promise together that we could all refer to as we go through the year. Having a statement that we all write together and feel responsible for is powerful. All the students got involved in the writing and everyone knows exactly what is expected in our classroom. I had our promise poster printed from Vista Print this summer, it worked out perfectly. It's laminated so I can write on it and wipe it off at the end of the year. Here's what we came up with! 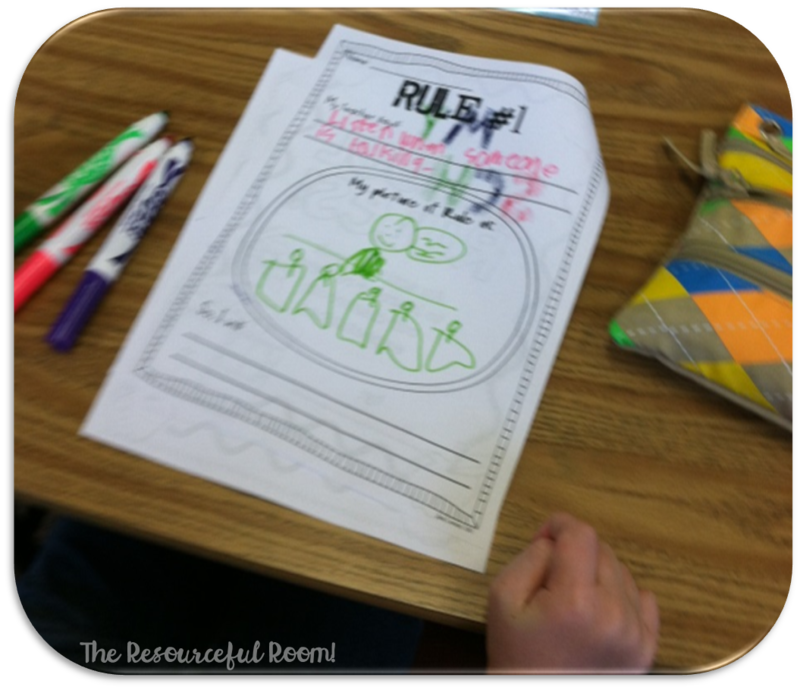 I was so impressed with the response, I'm looking forward to adding this to my classroom management plan every year. I especially liked "ask forgiveness when needed." When students came in on the first day they had a copy of their name in bubble letters on their desks. They colored their names as I took attendance and helped those who didn't bring supplies on back to school night. 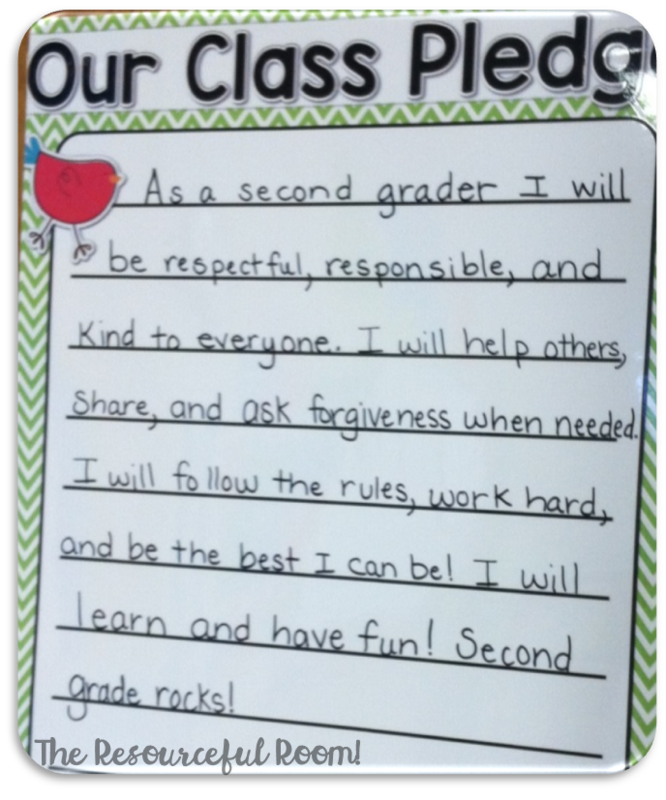 Then they glued their names to colored card stock and they went on the door next to our class pledge poster. I love how colorful and bright it is, and it's a great reminder all year what our expectations are. The second thing that we do to make sure everyone knows our expectations is Amy Lemons School Rules booklet. 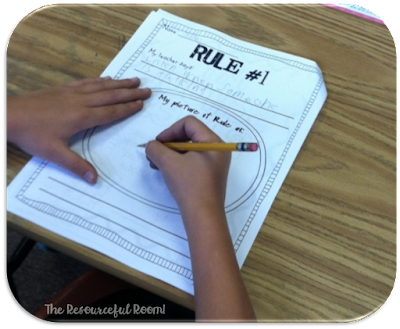 There is a page for each of our classroom expectations, we write the expectation, draw a picture of what it looks like in the classroom, and finally write in their own words what they will do to show they will follow that expectation in the classroom. I did this with my class last year and I loved it. I know everyone knows the expectations, and understands how to follow them. It's also easy to see who isn't understanding and have a conversation with them as well. The last page of the booklet has a contract for students to sign and date saying they understand the expectations. I sent these home so parents could see them as well. I got lots of positive comments. These are my two favorite ways to get the year started right. What do you do to help your students build classroom community and learn expectations? I'd love to hear your ideas!